3D Packing is designed by Centre for Computational Technologies - CCTech for the benefit of the manufacturing community. 3D Packing helps the user print a larger model. The App packs selected components as per provided printer dimensions. 3D Packing helps you combine many small components in one single printing process with clearance. This helps you save time, energy and money. 1. 3DPacking add-in is updated to provide standard printers for packing. User input for printer volume is removed. 2. Startup message box and waiting message box removed. Thank you for making such a useful plugin! I was wondering if you could add back the build dimensions dialog? 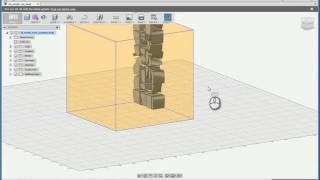 I'm using F360 to layout wood shelving for my garage (and I would like to later CNC cut it at our local Makerspace). I would love to see if your plugin could nest on a plywood sheet with a minimum spacing option. (1.5mm if I'm using a track saw, or cutter width like 3/8" on CNC). It would also be handy for non-CNC cutting to keep cuts at 90 degrees (more waste, but way simpler to cut). Woodworkers will pay for a plugin if it can auto nest across sheets, give a sheet count, etc. Thanks again, and let me know if you have any interest in this and if I could help (beta, share my designs, etc). Nester on github will do this. It is mostly auto layout, you set a distance to sperate and then a line to align to. Then you move the components around to fit best. Getting things to fit automatically is not in it yet. there is software that will do this, but it is a bit pricey. one of the least expensive is sketchlist 3d. I use it to design some cabinets and then generate the most efficient layout. Choose the kirf thickness based on the router bit for separation and then export as dxf to generate gcode from the cam in fusion. I am trying to get away from that because of how fast I can generate designs with parameters. It would be nice to generate a design and then have the layout update as well without much work at all. Not there yet.